They seem to be mostly larch. 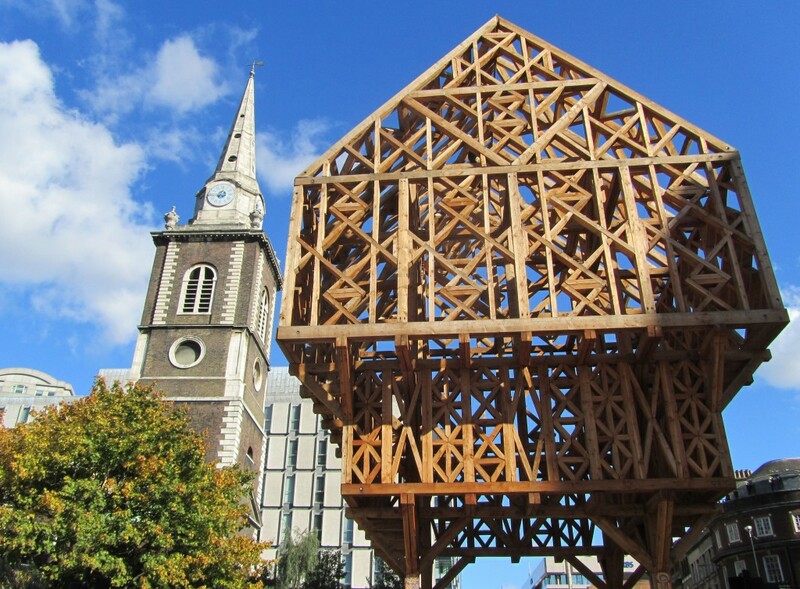 This intricate timber frame construction is made from 17 cubic metres of larch. 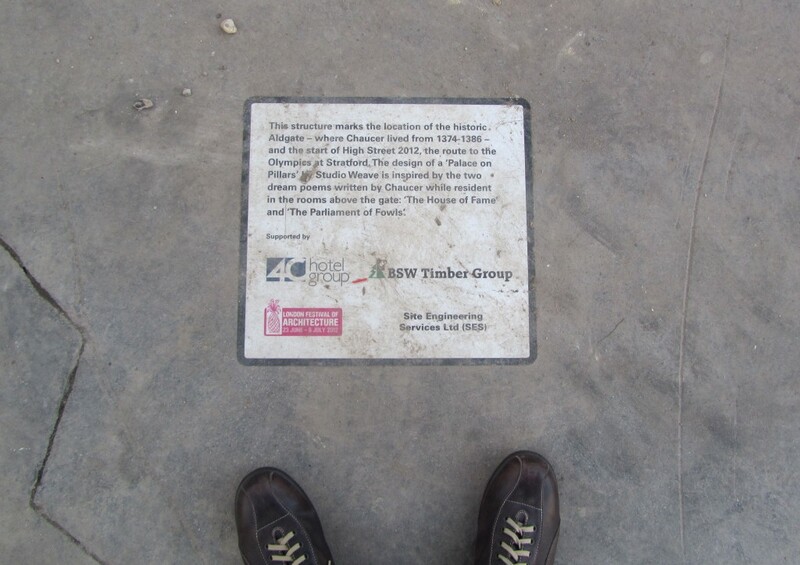 It stands on a traffic island by St Botolph’s church at the start of the A11, the road from London to Norwich, and it marks the place where the Aldgate once stood. Aldgate was the easternmost gate of the old wall of the City of London. From 1374 the rooms above the gate were occupied by Geoffrey Chaucer. Paleys Upon Pilers, designed by Studio Weave, is a latticework pavilion on stilts with decorations by Linda Florence. It is part of the London Festival of Architecture, a celebration in response to the London Olympics. 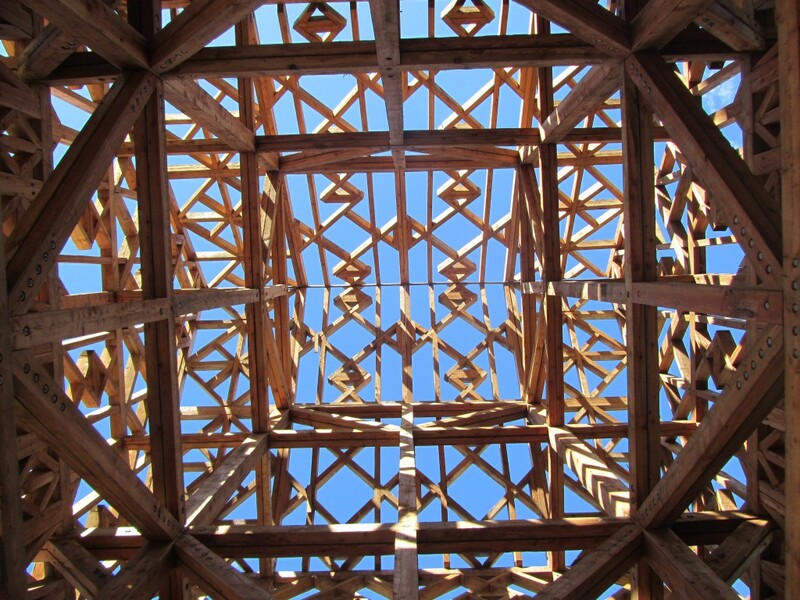 Look up and the structure divides the sky with its tessellated geometry. But look carefully and there’s a piece missing. Is this like the deliberate error of Islamic artists who say only God creates perfection? Just a little below this, perched on a high rafter, sits a wise wooden owl named Geoffrey. 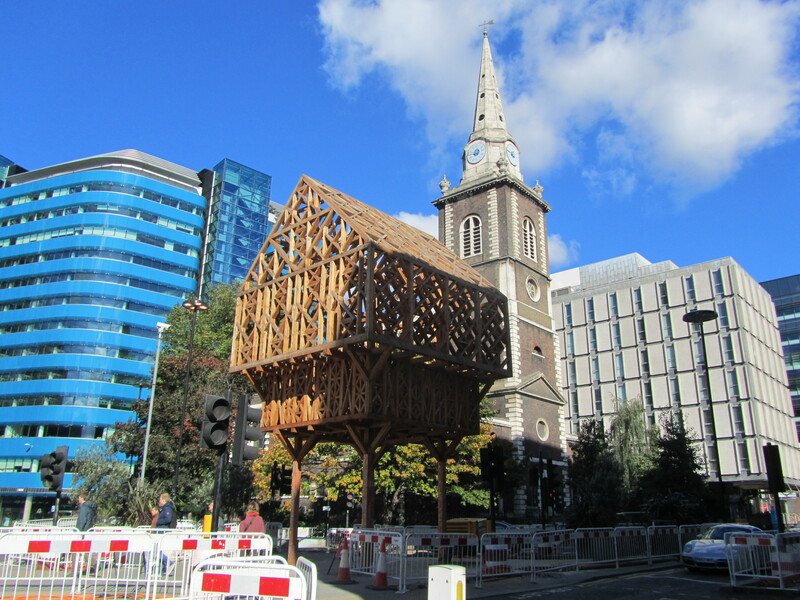 This structure marks the location of the historic Aldgate – where Chaucer lived from 1374-1386 – and the start of High Street 2012, the route to the Olympics at Stratford. The design of a ‘Palace on Pillars’ by Studio Weave is inspired by the two dream poems written by Chaucer while resident in the rooms above the gate: ‘The House of Fame’ and ‘The Parliament of Fowls’. A little further east at the Whitechapel Gallery and, in keeping with the season, the leaves on their trees are turning golden. These don’t look like larch trees. 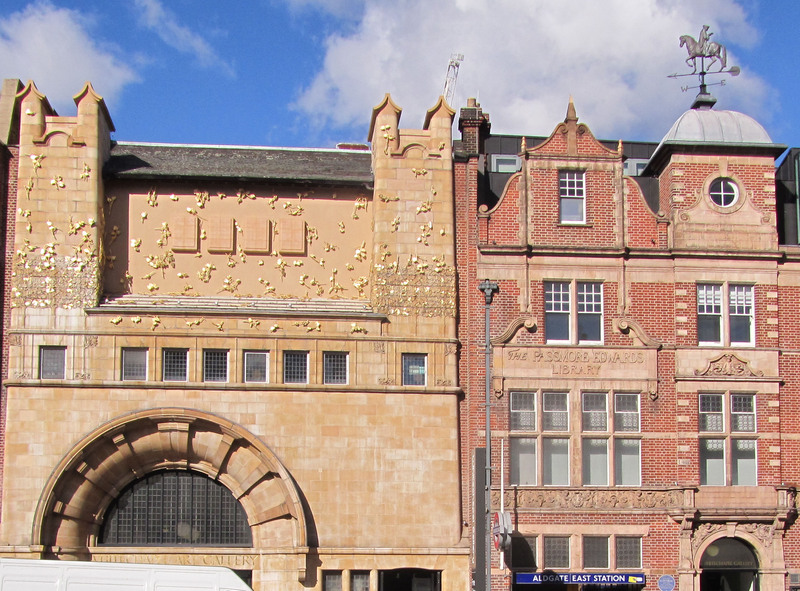 The building’s original facade was decorated with terracotta Tree of Life reliefs. 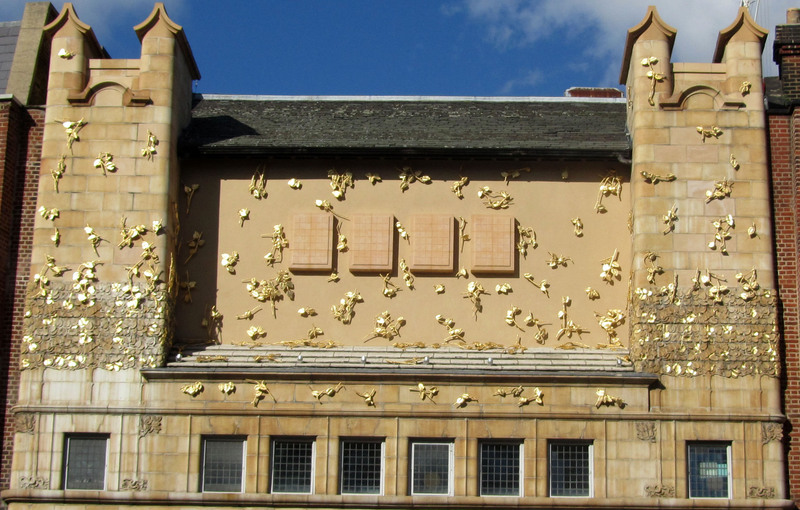 Rachel Whiteread has taken casts of their leaves, remade them in bronze, gilded them with gold leaf and scattered them across the front of the building. Tree of life cast leaves gilded with gold leaf left golden with gold leaf leaves left cast to the streetlife. 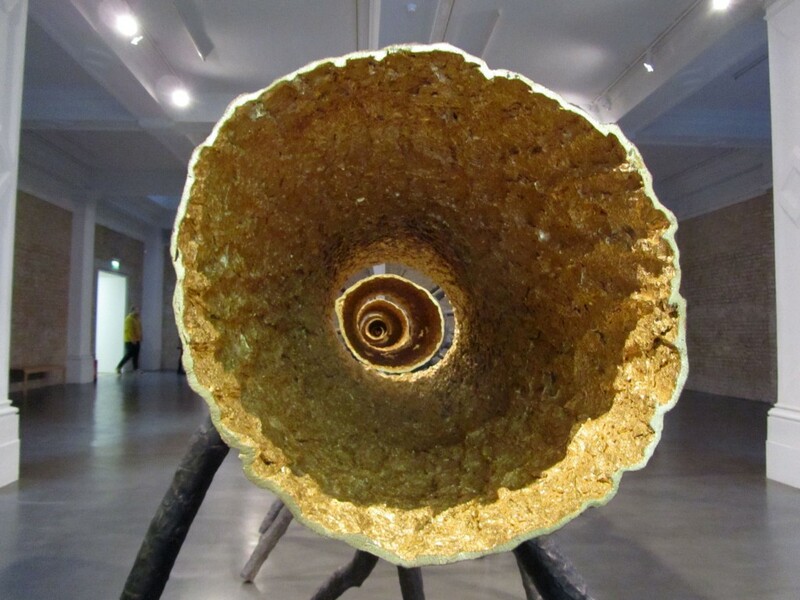 Inside the gallery there’s more larch, this time the echo of a larch tree, cast in bronze, its hollow centre illuminated with more gold leaf. 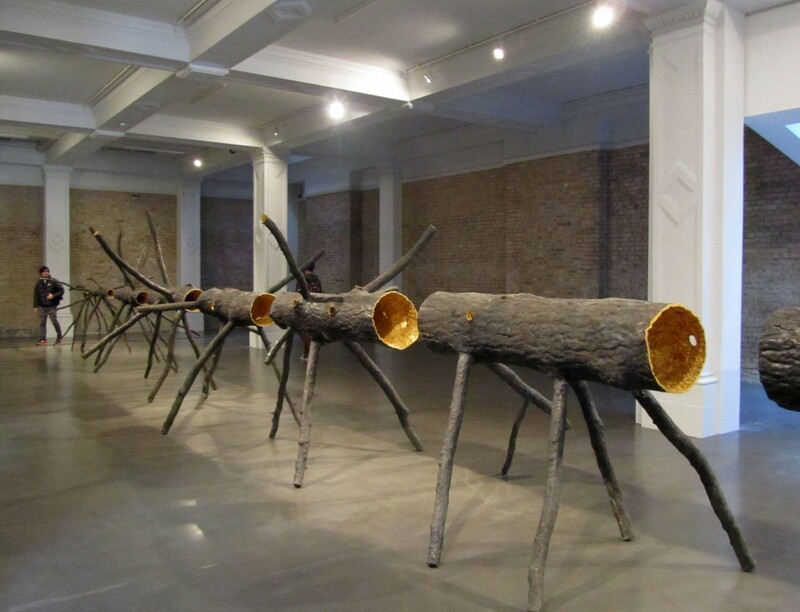 This is a sculpture by Giuseppe Penone, Spazio di Luce, a larch tree cut down and filleted, designated precious and undeniably beautiful, like a David Nash sculpture taken to the next level. It’s hard to imagine how it was gilded. Did he employ child chimney sweeps to crawl inside to apply leaf after leaf? The trace of the tree has become a light filled holloway. A ghost tree, a sacrificial tree, simple and elegant but also magnificent and transcendant. 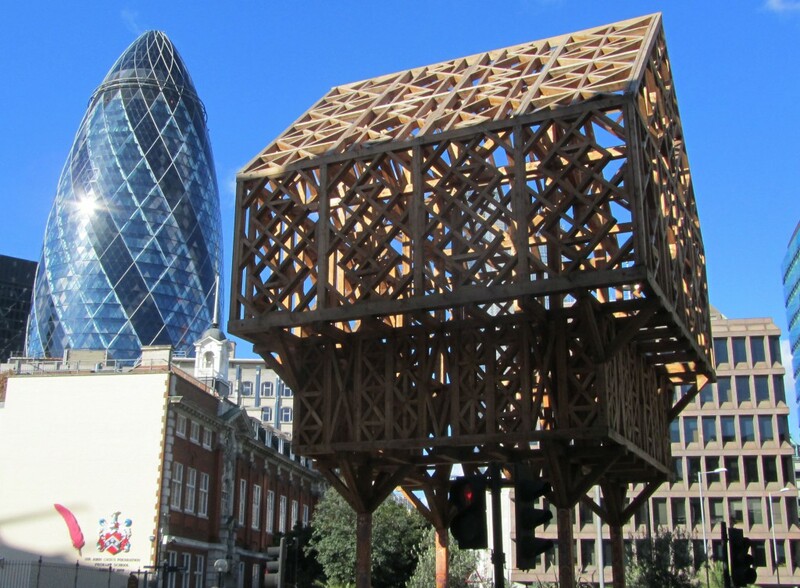 This entry was posted in Art, Buildings, Frames, Sheds, Trees, Video and tagged Aldgate, Giuseppe Penone, London, Paleys Upon Pilers, Rachel Whiteread, Spazio di Luce, Studio Weave, Tree of Life, Whitechapel, Whitechapel Gallery. Bookmark the permalink. Another fascinating journey, maybe I won’t actually have to go to London again! Another blogger I’m following posted about how her face looked sad in repose and it’s got me thinking a bit. I think this artist has quite a sad face.